Chilly temperatures and snowy weather create conditions unfavorable for hunting and photographing bugs in the wilds of Maryland. Over the next several weeks, Bug of the Week will delve into our files and answer questions sent by bug aficionados. 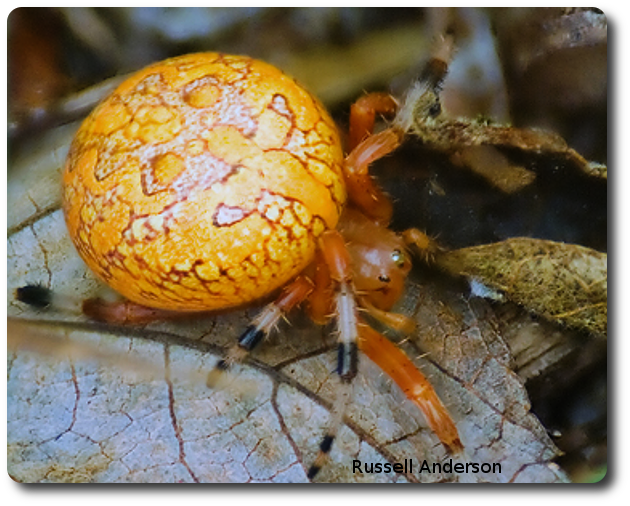 The first fantastic creature from our bug files is the gorgeous marbled orb weaver discovered independently by Russell in Virginia and Allison in Maryland. The marbled orb weaver is a close relative of the black and yellow garden spider we met in a previous episode last summer. One look at the ornate coloration and patterns on the abdomen of this spider leave no doubt about how this beauty got its name. The marbled orb weaver is found throughout the contiguous lower 48 states and as far north as Alaska. It is also a common denizen of forests and fields in Europe. A marbled orb weaver rests in the venter of its web in Allison's backyard. Photo credit: Allison Elder. Like other members of its clan, the marbled orb weaver spins a web of radial threads like the spokes of a wheel upon which spiral sticky capture-threads are placed. Capture-threads are remarkable evolutionary products of millions of years of bioengineering. Each capture-thread has a core of silk bearing scores of tiny droplets of viscous glycoproteins. These glycoproteins give the web its stickiness. Hapless insects that blunder into the web are trapped by the sticky silk until the spider can scamper to its future meal and deliver a lethal paralyzing bite. The marbled orb weaver has a clever strategy to capture prey while limiting exposure to its own enemies. After constructing its amazing web of death, the marbled orb weaver hides in a retreat near the web. The retreat might be a cluster of dead leaves or a piece of loose bark. A strand of silk called a signal thread runs from the web to the retreat. When a potential victim is snared by the web, vibrations travel along the thread and alert the orb weaver to the presence of its prey. The message is simple and clear - dinner is about to be served. “The National Audubon Field Guide to North American Insects and Spiders” by Lorus and Margery Milne and “Estimating the Stickiness of Individual Adhesive Capture Threads in Spider Orb Webs” by Brent D. Opell were used as references for this episode. Bug of the Week gives special thanks to Russell (WWW.RWAPHOTOGRAPHY.COM) and Allison for the images and inspiration for this episode. To learn more about marbled orb weavers, please visit the following web site.